Jacob Prak, MMI CEO (L) presents the All Star Award to Mitchell McAdoo. 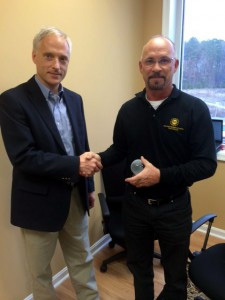 Stevensville, Md., December 17, 2014 — Michigan Manufacturing International (MMI), a leading broad line supplier of high-quality mechanical assemblies and components, presented the MMI All Star Award to Mitchell McAdoo at its annual sales meeting on December 8. McAdoo, who serves the Texas and Oklahoma region, was recognized by MMI CEO Jacob Prak as the company’s top revenue generator for 2014. McAdoo’s efforts resulted in establishing MMI’s presence among hydraulic fracturing equipment producers in the oil and gas industry. Jacob Prak commented on the award, saying, “Mitch’s outstanding performance this year is quite an accomplishment. Through his hard work, MMI has expanded the markets it serves, providing custom assemblies, parts, and components for the hydraulic fracturing industry.” A focus on quality control was a featured topic at the meeting. Recent hire Prabhu Rajendran, Worldwide Quality Control Manager for the MMI operation in Hosur, India, is heading up this effort. The meeting also consisted of sales training modules conducted and facilitated by Benchworks, MMI’s marketing partner. Founded in 1991, Michigan Manufacturing International (MMI) specializes in supplying manufactured to print assemblies and components to original equipment manufacturers (OEM). Products include assemblies, castings, stampings, machined parts, gears, bearings and more. Services include product engineering, manufacturing, inventory management and stocking programs — all designed to streamline client operations and increase profitability. MMI designs the most effective, highest quality solutions from anywhere in the world. For more information about MMI, visit www.michmfg.com or call 800-677-0504. Photo caption: Jacob Prak, MMI CEO [L] presents the All Star Award to Mitchell McAdoo.